Cyklop CTR 2000 Automatyczna owijarka do palet przeznaczona do linii automatycznych. Zużycie sprężonego powietrza: około 60 NL/ paletę, ciśnienie 6 bar , podłączenie 1/2"
GL 2000 + ITFCoca-Cola, Haninge, Sweden. Since this video where publiched (081010), Cyklop have installed 2 more machines, all GL 2000 with ITF. Sivilingeniør Gisle Krigsvoll AS is an importer/wholesaler of tools and machines. We have been delivering merchandise to distributors all over Norway since we started in 1972. We have also been selling merchandise to distributors on the Swedish market since 1995. Trondhjems Eskefabrikk AS, NO Trondhjems Eskefabrikk AS presents itself as a very modern packaging manufacturer situated in the geographical centre of Norway. In their packing line they use Cyklop ring stretch wrapper GL 2000 with top sheet dispenser PLR and finally a fully automatic strapping machine XP 111 M.
This is a solution from our OEM company Bila (DK) and Cyklop (DK). Glava AS uses the Cyklop stretch wrapper to film their high and light pellets containing insulation rolls. Pre-stretch up to 300% thanks to our patented system Ecostretch Plus. H.Clausen A/S have installed two GL 2000 stretch wrappers with integrated top sheet dispenser from Cyklop. Factories in coastal regions with cold temperature and salt air, requires stretch wrappers that can be working in this environment, even with temperature temporarily down to -10°C. The stretch wrapper GL 2000 is working in a freezer facility in Norway. The company is situated in: Egersund, Bergen, Svolvær and Tromsø. Abroad the group has activities in Kiev, Ukraine and Skagen, Denmark. Do automatycznego przykrywania palet folią w ciągach produkcyjnych ( typ TF ) lub w integracji z automatyczna owijarką do palet Cyklop GL 2000 ( typ ITF ). Top sheet dispenser in fully automatic production line types TF or integrated into stretch wrapper GL 2000 type ITF. For extra water protection, the production line can be fitted with equipment which, together with the Cyklop stretchwrapper GL 1000 or GL 2000, will also meet this requirement. 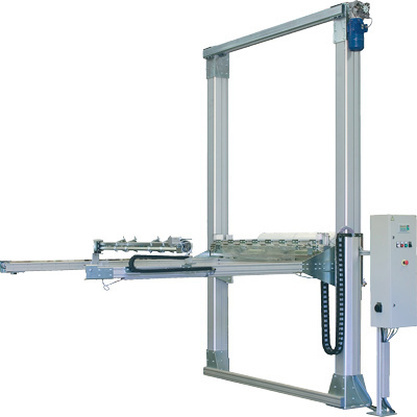 The Cyklop top film dispenser TF is usually included in a fully automatic line next to a stretchwrapper when palletized goods need protection from dust or dampness on top. The machine is easy to fit and made of aluminium.